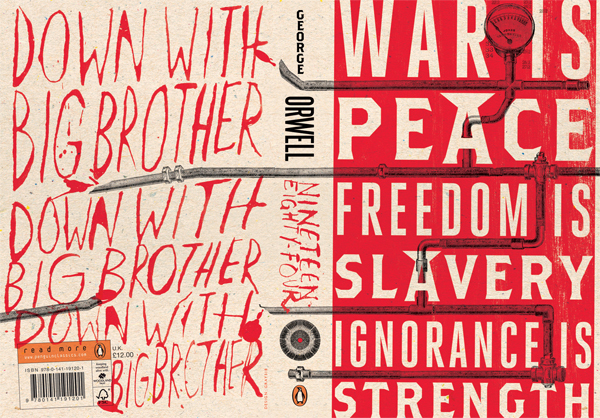 Alan Trotter offers up a bit of back story behind the aforementioned 1984 redesign. Last year I was a copywriter at Penguin and wrote a lot of blurbs for the Classics lists. So you get used very quickly to seeing your words on books by some of the greatest writers who ever lived. The job was a joy from start to end and there’s not a lack of things it was a thrill to be able to work on. And was kind of enough to show off the full jacket. That back panel is serious business. Thanks for showing the back cover. It’s a memorable moment from the book, and it makes a great visual rejoinder to the slogans on the front cover.